Bait Al-Harir (or “House of Silk”), poet and novelist Alaa Khaled’s new title, is a sequel to Ashbah Bait Heinrich Böll (“The Heinrich Böll House Ghosts”), which appeared last year. In both (which are published by Dar Al-Shorouk) Khaled walks a fine line between love and revolution, bringing to the surface a wealth of hidden questions about passion and revolt. In House of Silk, Khaled allows his hero and alter-ego, Mohsen Al-Hakim (literally speaking the name can mean “Benevolent Sage”), a novelist in his early 50s, to cross paths with Dawlat (“the State”), a young woman in her 20s, in the intimate maze of Tahrir Square during the January Revolution. They also step out of the square into the much larger labyrinth of Cairo. Along the same lines, their emotional and intellectual energy spills over affinity and camaraderie into intimate friendship and romantic love. The drive to understand the mysterious energy underlying a revolution as it plays out in individual lives also informs The Heinrich Böll House Ghosts, but instead of revolution unfolding in that earlier novel we see the seemingly unhappy effect of revolution after it ends. The Heinrich Böll House Ghosts revolves around an Egyptian writer who, after the revolution, goes on a residency at the house of the great German novelist, who was born during World War I and died a few years before the fall of the Berlin Wall. There he meets other writers, some of them from (eastern European) countries where revolutions remain similarly unfulfilled. “It is a moment of reflection on the real meaning of a revolution, the dynamics it creates and the hopes it prompts; it is about this strength that might not go too far but is there for a certain moment,” Khaled argues. This is reflected in the flow and ebb of hope reflected in the writers’ conversations and in the protagonist’s weekly column, in which he attempts to analyse the revolution, trying to understand “the energy it creates, which goes beyond mere enthusiasm or the mere capacity for joy or optimism” as well as the “geographic construction it creates for those who take part in it and those who believe in it… those who come together overcoming all divides… those who join not thinking of their name or age or those of the others standing next to them… those who want this togetherness so much they decide to be in one picture taken by the camera of someone’s smart phone”. As he writes in The Heinrich Böll House Ghosts, the revolution is “a dream that takes history by surprise”. It precedes belief, bringing joy followed by remorse. That book was his attempt to help the “defeated souls” who witnessed the retreat of their dream. But in the new book he steps back into the joyful hope of the event unfolding. “It is all about our ability to revisit the place where we were and to revise our position, to think things over and over again. We step into a revolution and then wonder what happened to the dream of freedom and we fall in love and then ask ourselves if we should have let it happen. This is the nature of emotion and the nature of revolution. They are not static, and perhaps they can even at times be reborn. “Attorney: What do you mean here by the revolution? This is how Tawfik Al-Hakim imagined the trial of four young Americans who, in protest of the Vietnam War and the economic hegemony of multinationals, attempt to blow up the Statue of Liberty. The relevant essay, “The Case of the 21st Century”, is the last of 20 chapters making up his 1984 book The Revolt of the Young, available at the book fair alongside other titles by the great 20th-century writer in a new Dar Al-Shorouk edition. All through the book Al-Hakim takes the side of the young, emphasising their vigour and insistence on making the world a better place. Each chapter is an independent essay that takes one aspect of the meaning of a revolution (sometimes opposed to upheaval), the older generations’ anxiety about change and the many faces of revolution from politics to science and art. Many essays are based on Al-Hakim’s own experiences: his relationships with his father and son, for example, and how the father refuses to take the son’s legal advice even though said son is a judge — so as not to “rely on children”. Al-Hakim had been a public prosecutor before he devoted himself to writing in the 1930s, producing an astounding number of novels, plays and essay collections in the next six decades. Born in Alexandria in 1898, Al-Hakim was extremely young when the 1919 Revolution broke out, but according to Cairo University English professor Mona Radwan — who translated The Revolt of the Young nearly 10 years ago — the experience was to inform everything he wrote. This is especially true of her favourite of his books. Radwan found The Revolt of the Young in the library of her late mother Afaf Khalifa, to whom she dedicates the translation, and she was immediately impressed. “It was a fascinating read and I decided that I wanted to translate it because I saw in the texts of these essays much of what I was seeing in the discussions of university students,” Radwan says. In 2010, without a publishing contract, Radwan embarked on the job. By 25 January 2011, her translation was almost done and her mind was set: “the youth of Egypt would do it”: “Many of the people I knew were sceptical but I was convinced it was going to happen. Maybe I was just influenced by what Al-Hakim wrote in this book about the ability of the young to make revolutions happen. “‘Every revolution is a sign of vigour and youth is the most vigorous stage of life, so it is no wonder that revolutions are led by the young,’ he wrote in his own introduction to the book. As Radwan wrote in her introduction to the book, Al-Hakim saw what makes a revolution happen: when the young are so frustrated with the status quo they can no longer accept. She added that he also saw what makes a revolution crack and maybe even fail when he wrote about “young people [who staged a revolution] not having forming their own strongholds yet, being new to their revolution and their own sense of self”. 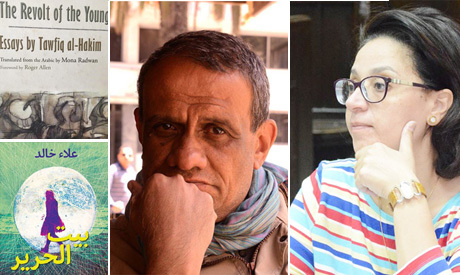 In the winter of 2012, while the revolution was having its first major hiccup, Radwan felt it was time to bring the book to English readers, to contribute to the world trying to understand the political events unfolding non-stop in Egypt. Later in 2012, Radwan signed an agreement with Syracuse University Press to publish the book, which finally came out in 2015, with a foreword written by Roger Allen in which he hails it as the carrier of “uncanny harbingers of issues raised by the events that have occurred in Egypt” in the winter of 2011, emphasising the distinction Al-Hakim makes between freedom from something and freedom to do something. Radwan wrote her own introduction a year later describing “an ongoing revolution”. Such fluctuations were evident in the positions taken by Al-Hakim, who having supported the Free Officers coup-turned-revolution of 1952 — Gamal Abdel-Nasser, the leader of the revolution, had been inspired by Al-Hakim’s work — turned against it later in life. A 1952 play, Soft Hands, reflected his support for the revolution, a 1960 play, The Bewildered Sultan, expressed doubt and perplexity, and finally in Return of Consciousness, written in 1970 on Nasser’s death, there is an open revision of Nasser’s whole reign. His brush with Nasser’s successor Anwar Al-Sadat took place five years later when, along with all the top literary figures of the day including Naguib Mahfouz, Al-Hakim refused to sign the president’s proposed “moral code” for public figures.